Beautify CNMI's friend Walt Goodridge has been nominated for a Jamaican Blog Award in the category of Best Jamaican Overseas Blog for his blog, Jamaican in China. Please take a moment out of your otherwise busy schedule to help Walt. Visit the Jamaican Blog Award website and vote for Jamaican in China. Incredible activity at the Paseo de Marianas last Thursday (12/2) night as the Christmas Tree project is in full swing. Students from various schools par-taking in the contest to decorate trees with recycled materials. The winners will be announced on December 16th. Then there was the Jumbo Tree Lighting and Ribbon tying ceremony. Different colored ribbons represent different causes or charities. Beautify CNMI! and partners are represented by Green Ribbons. After a brief introduction at the main stage, we took our buckets of ribbons to a cental table where anyone who wanted to write a message on a ribbon and tie it to the tree could do so. In fact, if you missed the opening event, you can still visit Kinpachi Ice Cream shop any time to request a ribbon to tie on the tree! Beautify CNMI! 's Laurie Peterka with PDM Promoter's Horiguchi-san - comrades in in supporting all efforts to help inspire the all peoples of the CNMI to take care of our beautiful island and each other! Saipan, Northern Mariana Islands – There is one week remaining for local writers to put the finishing touches on their short stories, poems, and essays before the deadline to submit writing for the upcoming anthology of Mariana writers, Stories from Wild Bill’s: Life, Love, and Spicy Tofu. The deadline to submit is Wednesday, December 15, 2010. Submissions will be blind reviewed by a panel of editors and writers chosen for publication will receive two copies of the printed book. The first edition is scheduled for a Spring 2011 publication. Please refer questions to Villagomez at wildbillstories@gmail.com. Beautify CNMI! is a coalition of concerned citizens, private groups, and government entities united to enhance the CNMI's natural beauty and foster community pride in its residents and visitors. It is important from time to time to remind ourselves of this sentence, because it has the power to refocus our attention to what is important. We want to use the statement in principle as much as we use it as a philosophy. To this end, at last week's year-end meeting, a few Beautify CNMI! partners discussed the potential value in setting up Affiliate Partner Agreements with Marianas Resource Conservation and Development Council. The purpose of doing something like this is to utilize one partner's (MRCDC) capabilities to the benefit of the whole coalition. In essence, MRCDC is an affiliate partner just like any other. 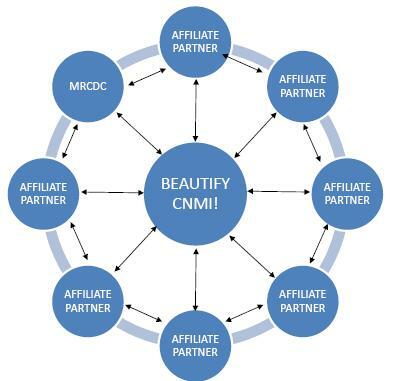 As with any affiliate partner, each brings a unique value to the Beautify CNMI! concept. MRCDC is the partner that could potentially provide administrative support to facilitate the total effort of all our efforts. The concept still has some kinks and requires further discussion, but looks something like this. We break it down into two perspectives to try to convey the idea (see below). In this concept, MRDCD becomes an affiliate partner with the rest of the Beautify CNMI! family. Using MRDCD as an administrative service/servant, allows the whole Beautify CNMI! concept retain its "loose coalition" style of getting things done in the CNMI. Creating the Affiliate Partner Agreements is not intended to place any one affiliate above any other affiliate or to suggest anyone group has more ownership or control than another. The purpose is administrative. The value is in how the administrative services can benefit both the Beautify CNMI! concept as a whole and as individual partner can benefit for their specific projects or groups. Perhaps not so coincidentally, one of the original coalition members and founders (Angelo Villagomez) used to work under contract for MRCDC. Perhaps he will read this post and contribute to the discussion here on this blog. Otherwise, the discussion on ground for this idea will continue in the next MRCDC meeting scheduled for Monday, December 13th. MRCDC's Saipan Committee meetings are loose-working meeting (not formal) where ideas can be brain-stormed or hashed out in a cooperative and friendly environment. If you are interested in attending or interested to learn more about the above idea, please email marianas.rcdc@gmail.com. Everyone is welcome! The highlight of this meeting is to present the opportunity to sign an MOU with Marianas RC&D that would create a partnership mutually beneficial to all Beautify CNMI! partners. We want your input! For additional meeting information, please refer to the original blog post for this meeting. Please come to the tree-lighting ceremony led by PDM Promoters at the Paseo de Marianas tonight, Thursday, Dec. 2, at the Paseo de Marianas. You will get a chance to pin different color ribbons representing different worthy causes on the giant tree. Beautify CNMI! 's color is GREEN, so let's show everyone our GREEN Beautify CNMI! spirit! Other GREEN-ribbon coalition partners, such as DEQ, MINA, FMI, and others, will also be there. So, come one, come all. This is an annual event that's not to be missed. So, all you Beautifyers out there -- come out and join us! But, don't just stop at the color GREEN (even if it's our favorite color), show your support by pinning the other different color ribbons on the tree, too! Also, we'll have fun watching the school children decorate their trees! This has become a much-anticipated fun tradition! Ceremonies will start at 7 p.m. and the ribbon-pinning ceremony will follow shortly after. So, bring friends and family and see you all there!